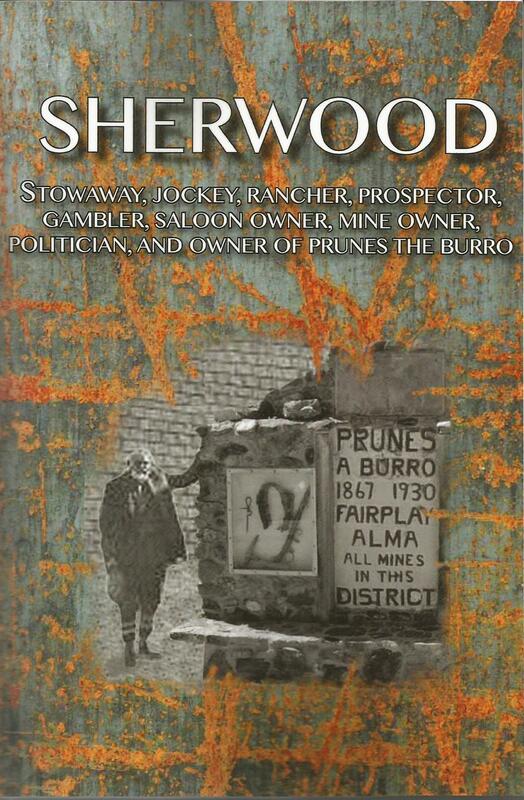 Rupe Sherwood is much more than that of his relationship as owner of Prunes, Fairplay, Colorado’s famous burro. Although well-known to everyone in Fairplay during his life, he is virtually unknown today, and when written about he is usually portrayed as a poor, starving prospector who never “stuck it rich” except in his relationship with Prunes. Rupe Sherwood was born in Wisconsin in 1849. He was orphaned at the age of twelve, became a jockey at that early age, and was smuggled aboard a wagon train headed for California. Along the way he won many wagers for his boss, other wranglers, and himself in races. When he got to Fairplay he began prospecting for gold. After successfully opening the Sherwood Mine, he turned to professional gambling, cattle ranching, owned a stone quarry, and had his name memorialized on a railroad stop. In later life he returned to prospecting and bought Prunes. Author Sherwood B. Stockwell has done extensive research on Rupe and the times that he lived in to help bring the story of Prune’s master alive and to correct the many inaccuracies about Rupe that have been placed in print.